Add a sturdy, vented shelf into almost any server rack or cabinet. 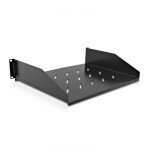 The Vented Rack Mount Shelf from V7 attaches to any standard 19 inch server rack or cabinet. These vented rack shelves improve air flow and help to lower temperatures in the rack. The durable shelf can hold up to 66 lbs (30 kg) of equipment for storing small, non-rackmount equipment in your rack.